BMW owners, normally you could play a video only while the car is parked or at a very low speed. To unlock the TV or the DVD video while driving, you need do some coding job. BMW NCS-expert is the best coding software, but DVD in Motion for CIC coding needs both NCS expert and NCS Dummy software. 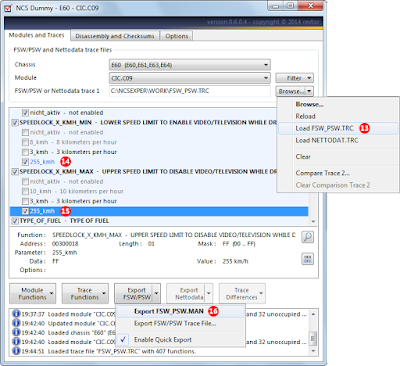 NCS Dummy can parse keyword trace files and retrieves all possible parameters, control unit data and order options for each function which makes NCS expert easier to understand. 3) Read the "FSW_PSW.TRC" trace file from the CIC module with NCS Expert and write down the module name (for example "CIC.C09"). 5) Select BMW Chassis and module, click magnifier button to open the Find window. Enter search item “SPEEDLOCK” and click “Find Next” (or click ENTER until you stumble upon the desired functions in the graphical trace editor: "SPEEDLOCK_X_KMH_MIN" and "SPEEDLOCK_X_KMH_MAX". Right-click function "SPEEDLOCK_X_KMH_MIN" and choose "Add Parameter" from the popup menu. 6) Select the new parameters (marked red) and enter a parameter keyword for it, for example 255_kmh. Set the data value to FF. Click the "Module Functions" button and choose "Update Module..." from the dropdown list. 7) When a system pops out a prompt asking to update the module CIC.C**, press OK to update the module. 8) Load the trace file you read earlier with NCS Expert coding software. Repeat previous operation to locate functions "SPEEDLOCK_X_KMH_MIN" and "SPEEDLOCK_X_KMH_MAX"
Search the function "VIDEO_NUR_MIT_HANDBREMSE" and make sure it is set to "nicht_aktiv". 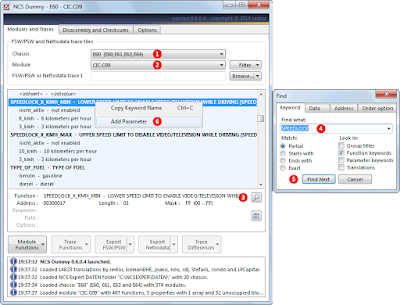 9) Select "Export FSW_PSW.MAN" from the "Export FSW/PSW" button dropdown menu (16) to save the settings to an FSW/PSW trace manipulation file for coding with NCS Expert. If "Enable Quick Export" is ticked you can quickly export the changes by simply clicking the "Export FSW/PSW" button. 10) Coding procedure is completed. Exit the NCS Dummy and NCS Expert software. Disconnect the BMW ICOM A2 wifi diagnostic system.